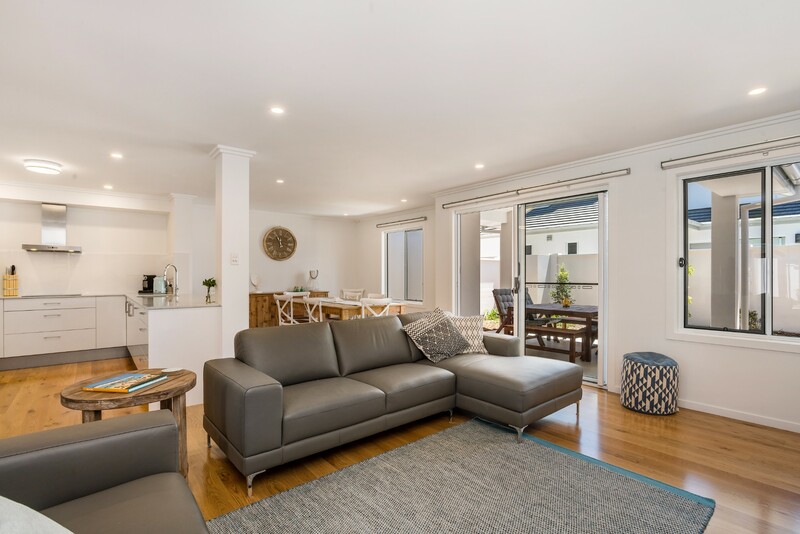 Imagine your next family holiday at Ocean Walk - a beautiful, brand new and spacious two-storey 3 bedroom, 2 bathroom villa, located within Byron Bay’s secure Seadrift complex, only 300m from town and a short walk from popular Main Beach. 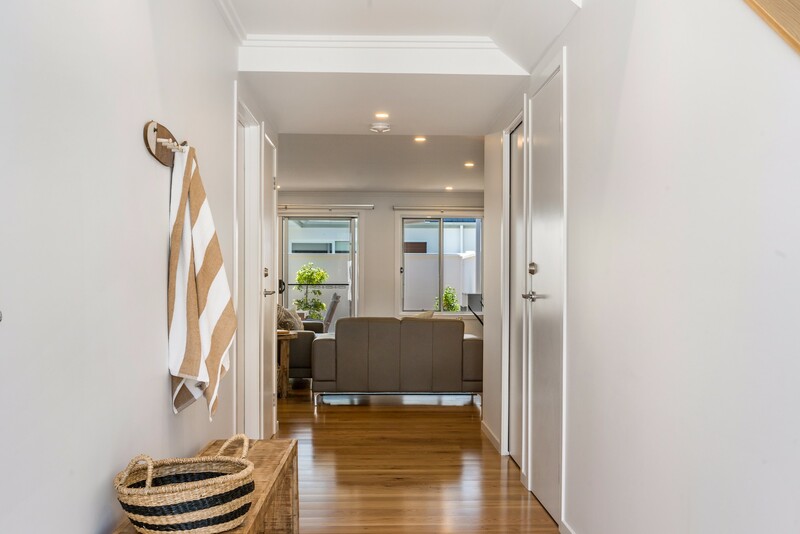 Sleeping up to 6 adults (8 with children), Ocean Walk is modern and luxurious, with an open-plan design, polished timber floors and a mix of finishes featuring timber, white and raw materials. 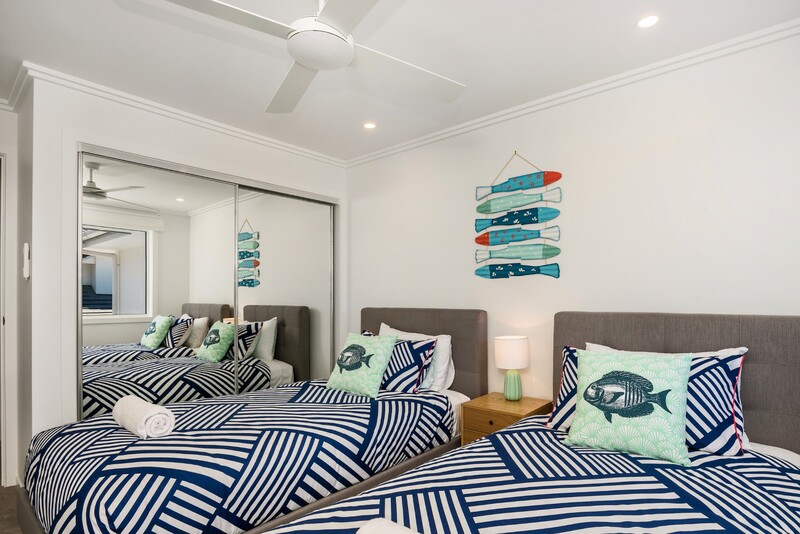 Bask in holiday luxury with gorgeous beach themed interiors, 3 spacious bedrooms, two living areas and two bathrooms plus powder room. 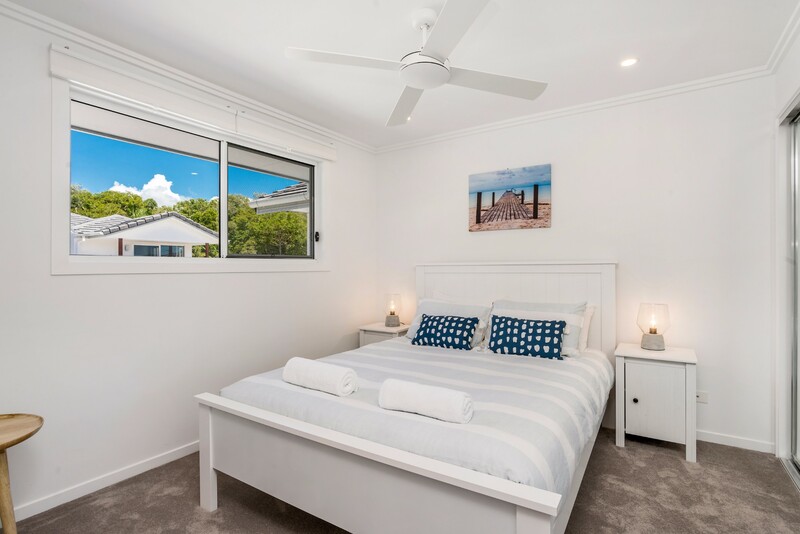 The perfect family home away from home, Ocean Walk is child and toddler-friendly, with baby safety gates at the top and bottom of the stairs, cordless blinds on all windows and a high chair, portacot with bedding and stroller available for guest use. 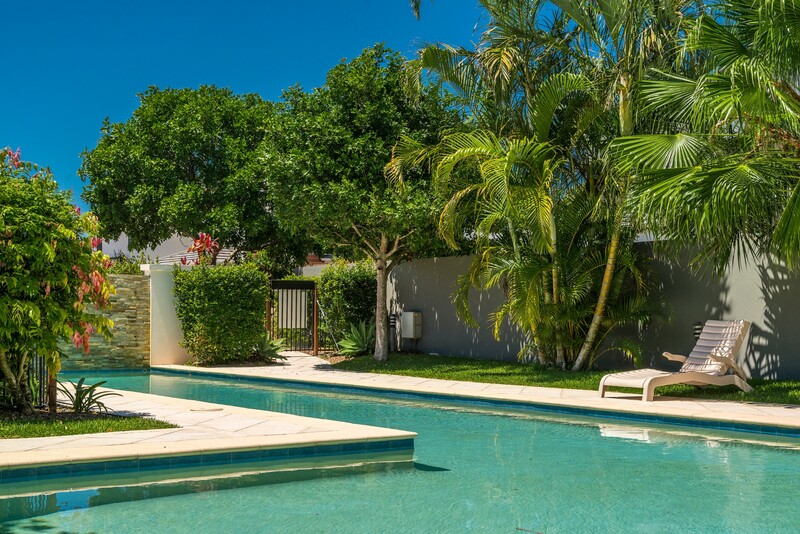 This stunning villa includes a private covered outdoor space with timber dining setting and BBQ and guests can also enjoy resort-style shared facilities within the Seadrift complex, including sparkling in-ground pool, sundeck, BBQ and kitchen area and entertaining pavilion. 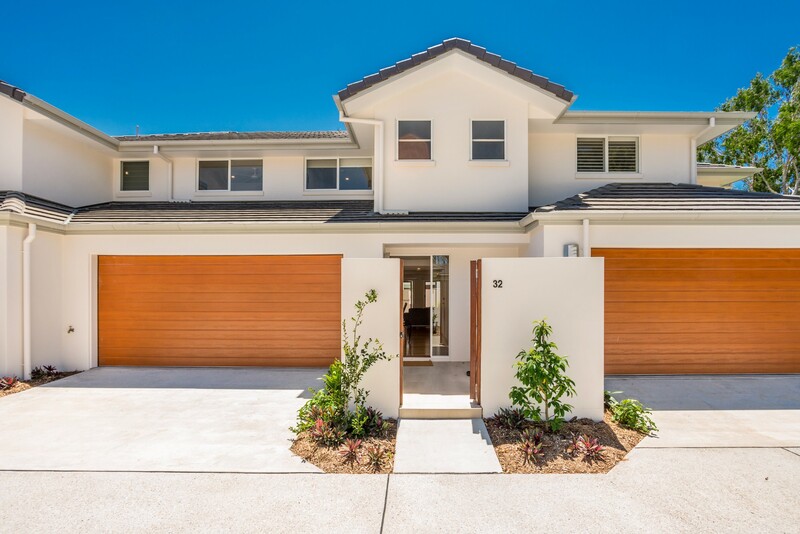 Park two cars in the double remote controlled garage with internal access and walk to everything, with Ocean Walk conveniently located less than 1km to the beach and only 300m from Byron Bay’s retail, dining and entertainment precinct. 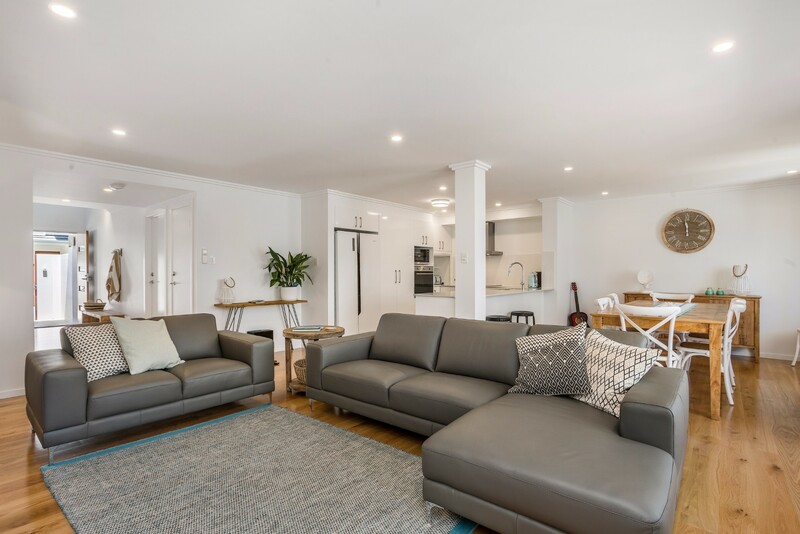 Ocean Walk’s open plan, light-filled living space is minimalist and modern, with two leather modular sofas, large wool rug and contemporary decor. Relax while watching Netflix on the 50 inch Smart TV and soak up your favourite sounds on the Samsung soundbar and subwoofer. Share meals bathed in sunshine at the 8 seat timber dining setting. The open-plan kitchen, living and dining opens out through glass sliders to the outdoor entertaining area. 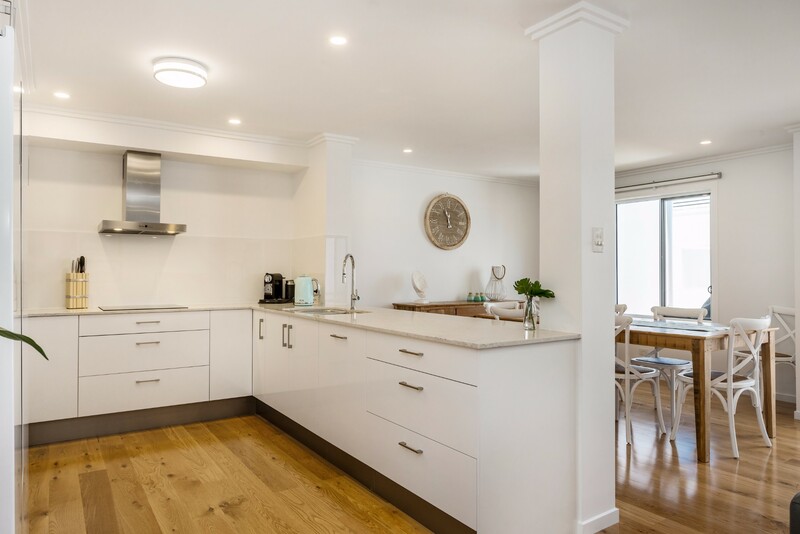 Ocean Walk’s beautiful new kitchen promises luxurious meal preparation, with high-end stainless steel appliances, including rangehood, cooktop, oven, microwave, as well as retro style jug and toaster and Nespresso coffee machine with complimentary capsules. 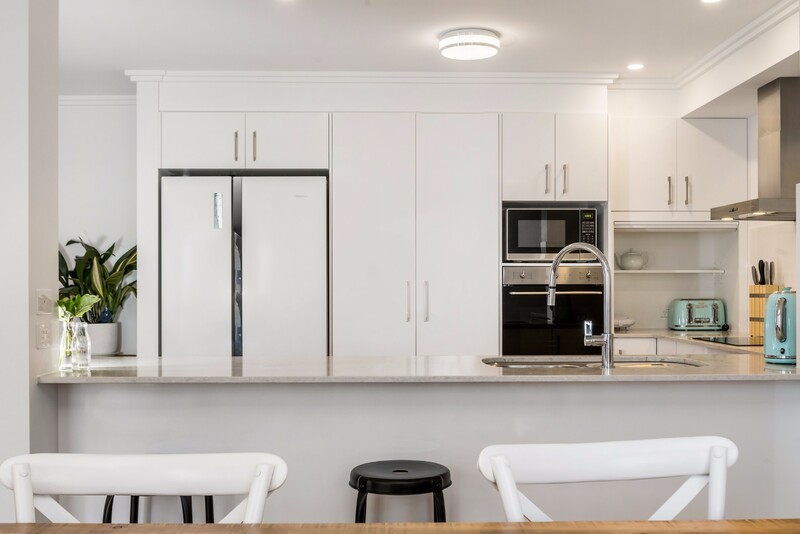 For an easy, casual dining option, guests can sit on stools at the breakfast bar that adjoins the kitchen and dining space. Upstairs, alongside the bedrooms, is an additional living space/media room, complete with fold out sofa and flat screen TV. Dedicate this space to kids reading and media, as it’s perfect for a kids/teenage retreat. Sleep in stunning, modern style in one of Ocean Walk’s 3 bedrooms. 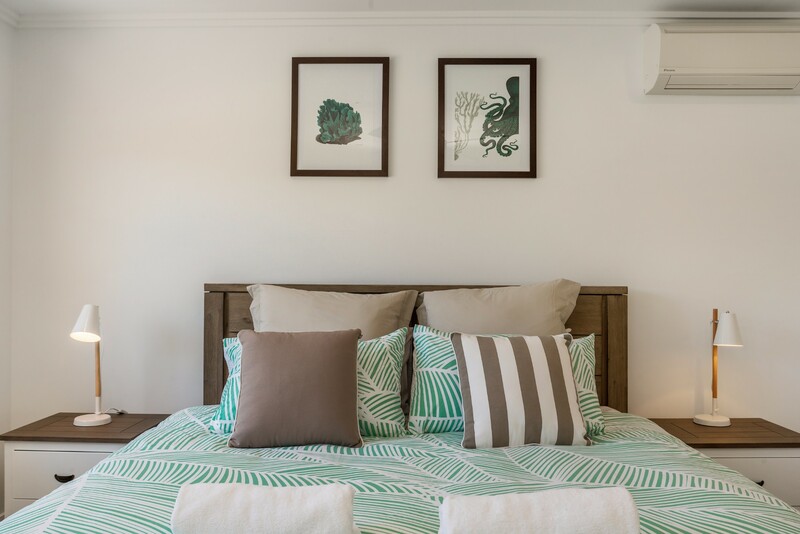 Light-filled, sleek and modern, the bedrooms showcase contemporary styling, with plush bedding and white and timber beach inspired interiors. 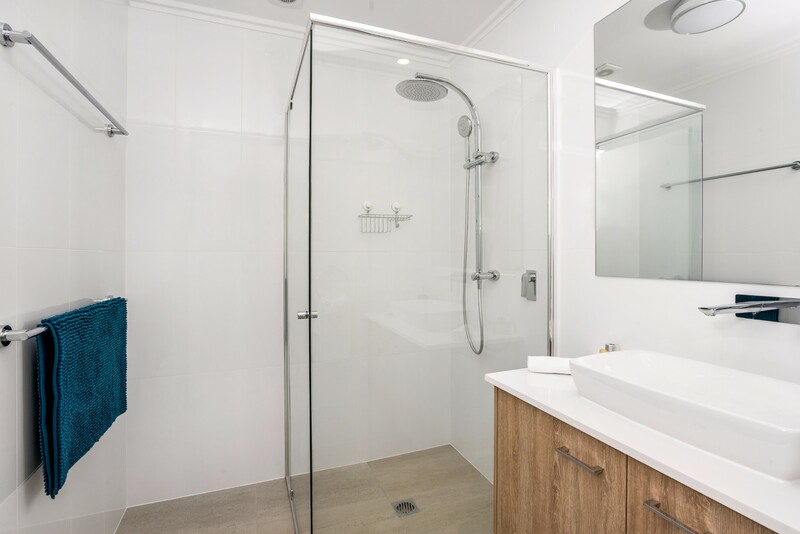 This brand-new villa includes two modern bathrooms, both stylishly finished with timber vanities and large shower spaces. 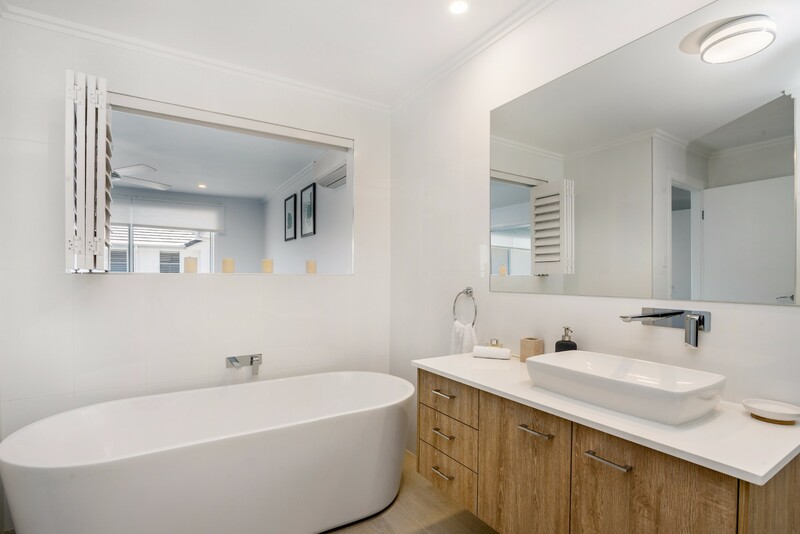 The ensuite bathroom features a deep freestanding bath and there is a separate toilet/powder room downstairs. 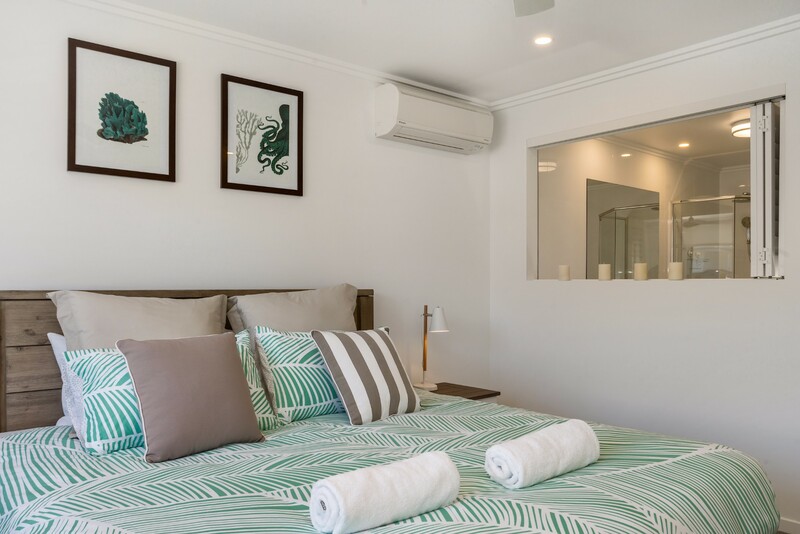 Stay a while at Ocean Walk, with a fully functioning laundry space that includes a washing machine and dryer for guest convenience. 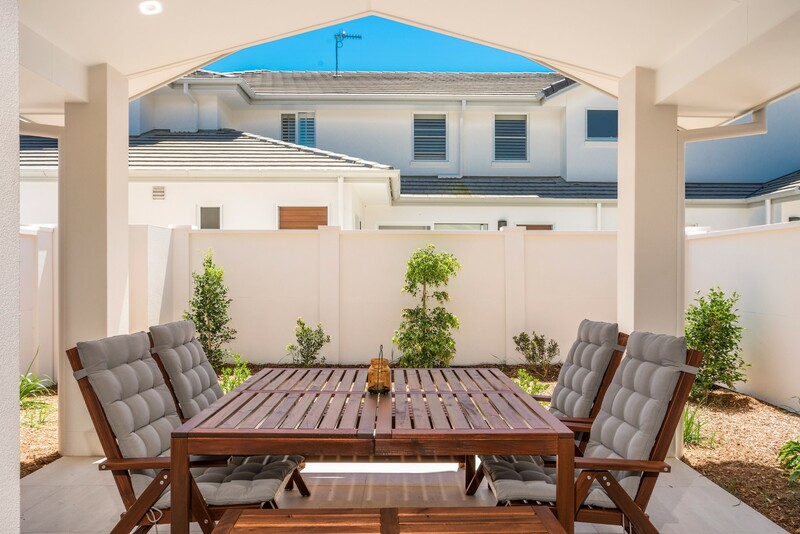 Enjoy the Byron Bay outdoor lifestyle with the light-filled covered outdoor entertaining area, complete with BBQ and high-quality timber dining table, timber bench seats and luxurious cushioned chairs. Keep the kids cool and take a dip in the stunning, shared swimming pool, located within the secure complex. 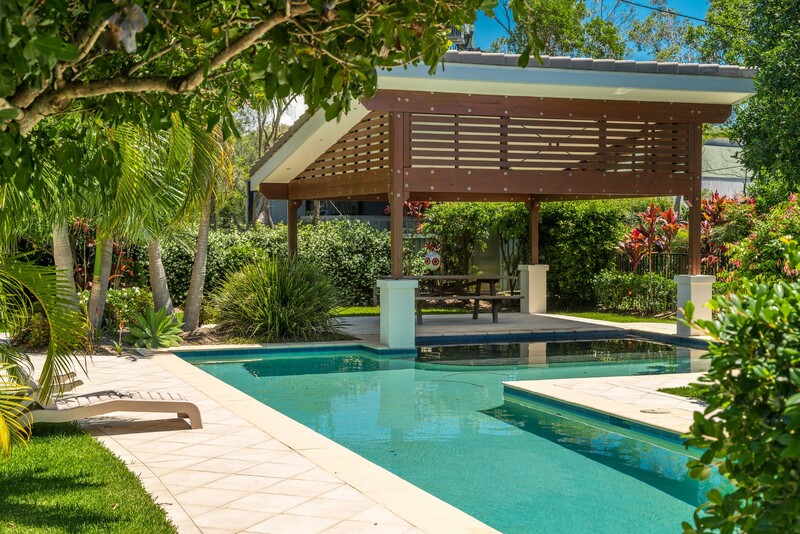 Sit within the shaded pavilion space or soak up the sun on poolside loungers. The villa has an automatic double garage with internal access and the complex also provides additional visitor parking. Experience the very best of Byron Bay from Ocean Walk’s central location. 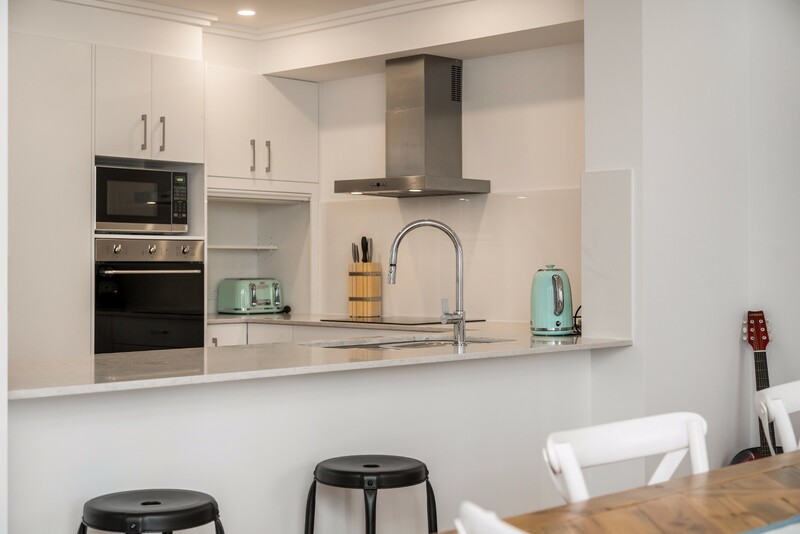 Wander only 300m to the centre of Byron Bay and access vibrant markets, hip local designers and boutique shopping, as well as world-class dining, with cafes and restaurants to suit all tastes and budgets and a lively social scene, with a range of bars, pubs and entertainment. From Ocean Walk, a short 1km walk will take guests to stunning Main Beach, a popular spot all year round for families, promising safe swimming, lifeguard patrols and relatively small surf. 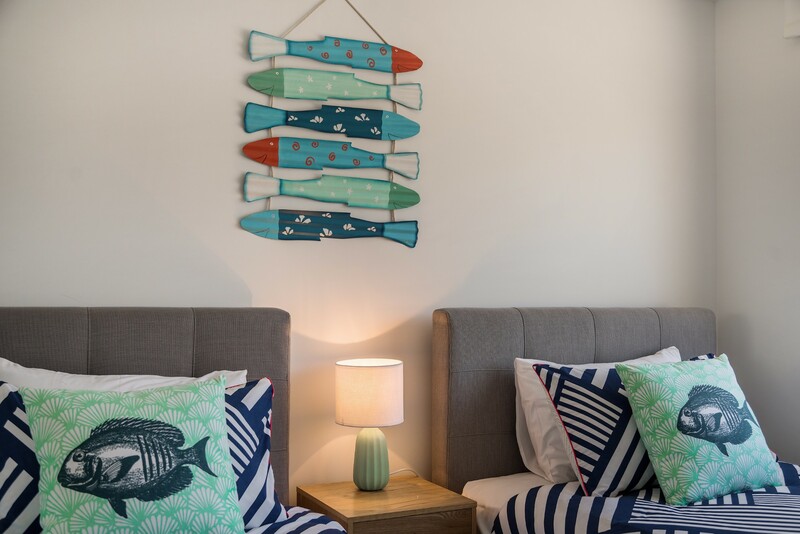 Ocean Walk is perfect for families, with the inclusion of baby safety gates for the stairs and the availability of a portacot and bedding, stroller and high chair for guest use. The separate upstairs living space/media room makes for the ultimate kids and teenage retreat and the complex pool will provide endless entertainment for the kids and adults alike. 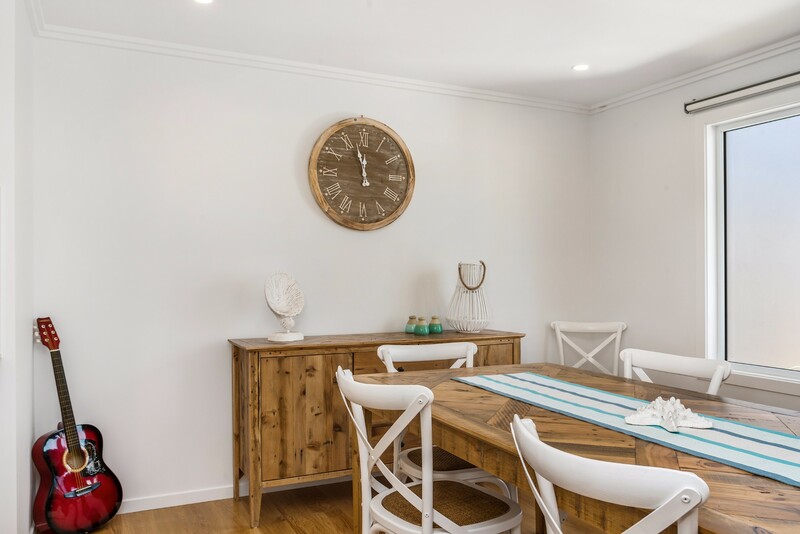 Byron bay is a beautiful holiday destination for a young family that loves spending time at the beach and local cafes/restaurants. 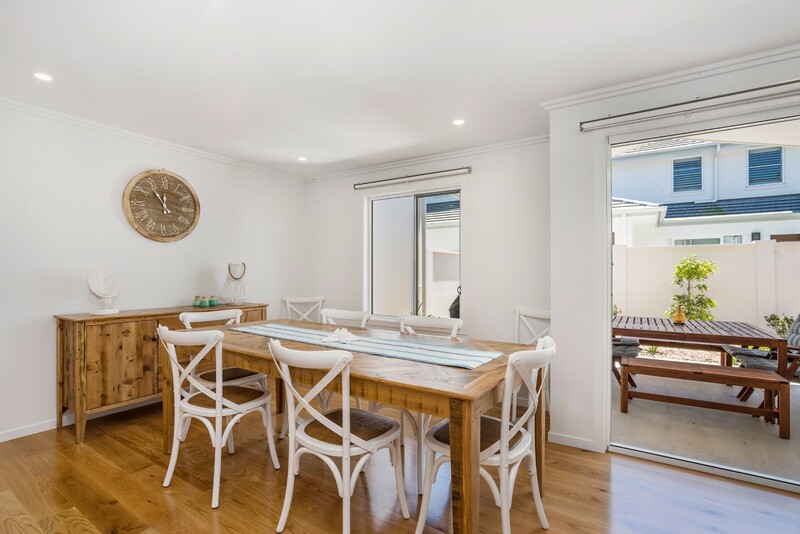 The apartment was super clean, modern and within walking distance of town. Thanks for a great holiday. Quiet townhouse with residential atmosphere. Good for young family needing gates on stairs, stroller and highchair in the garage ready for guests.